PanaVise is a major manufacture of CCTV Camera Mounts & Audio/Video Mounts. PanaVise's "Tilt, Turn & Rotate" technology has been applied to the CCTV Camera Mount Line & The Audio/ Video Mount Line. There's a camera mount available for every installation requirement! All PanaVise Products are covered by a Limited Lifetime Warranty! 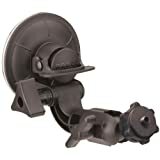 Powerful Suction Pad Attaches To Any Smooth, Flat, Nonporous Surface Including Windows, Sheet Metal, Fiberglass, Etc.